Hi everyone! 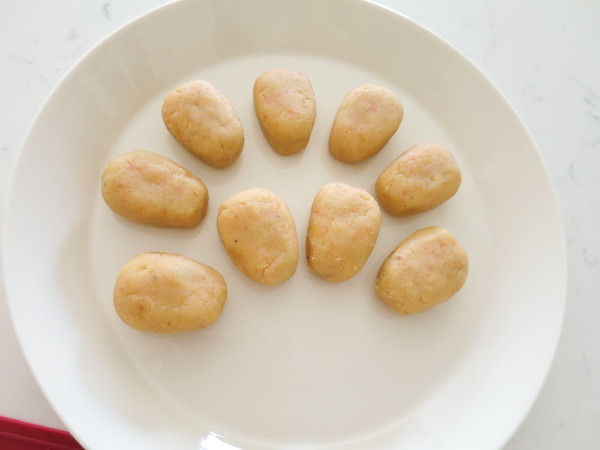 I have some good news – two sweet recipes to try this weekend! One is a sweet, crumbly Vanilla Confetti Bundt Cake and second one, as the title says, is for adorable marbled Owl Cake Pops! 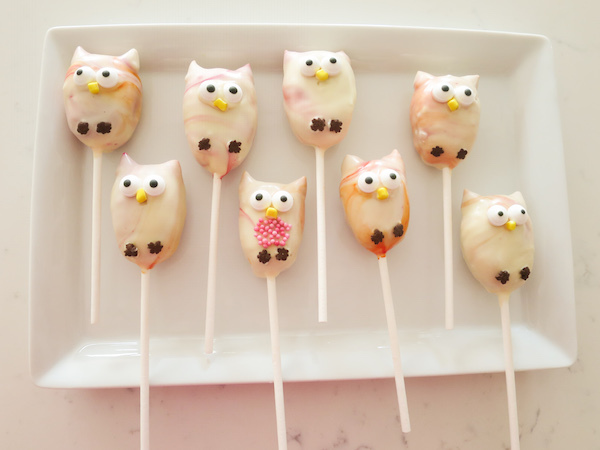 These owl cake pops are made of vanilla confetti cake and cream cheese icing. Their ears are butterscotch chips and their beautiful marbled coating is white chocolate with pink and orange chocolate colouring. 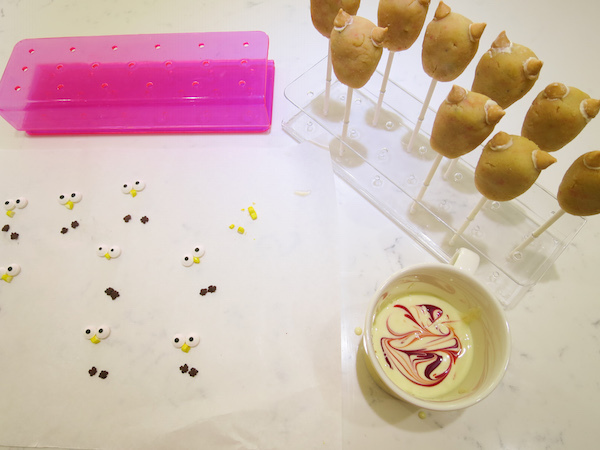 It’s been a while since I’ve made animal cake pops… In fact it’s been over a year since the cute Baby Sheep Cake Pops and yesterday I just woke up feeling OWLSOME and went with the whim making an aromatic vanilla cake with sprinkles that lead to pastel marbled owls! Sometimes you just have to go with the flow and sometimes with a baking flow you may end up surprising yourself. They look quite darn adorable don’t they? In a mixing bowl beat cream cheese, milk and powdered sugar until smooth. 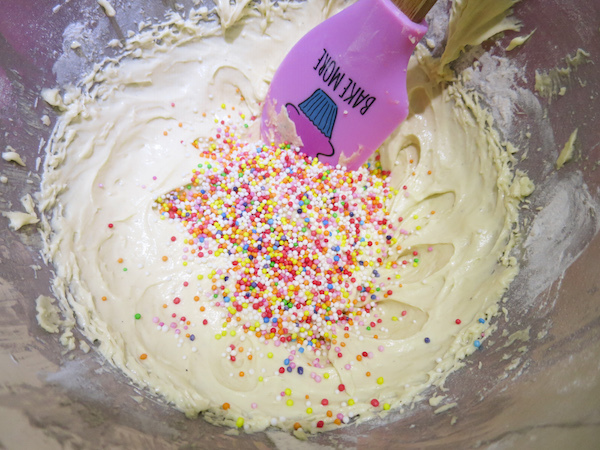 Combine cake crumbs and cream cheese frosting starting mixing with spatula and eventually mix by hand until smooth and form into a ball. Take small portions, 19-21g (0.67-0.75 oz) and shape into cone shape with round edges. 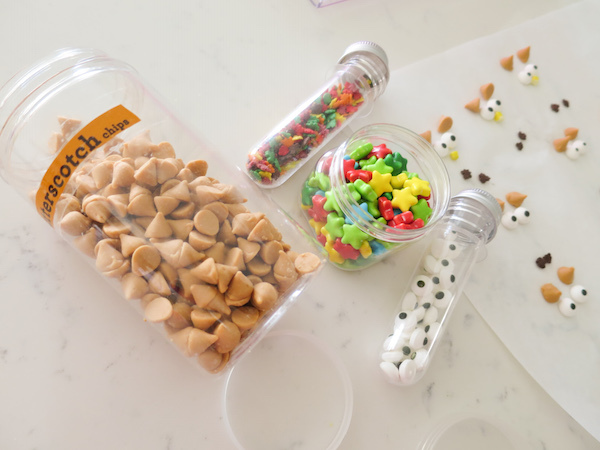 Place in refrigerator and allow to chill while preparing for coating and decorations. For easier application of the decorations prepare a set of ears (butterscotch chips), eyes (candy eyeballs), nose (piece of yellow star) and feet ( maple leaf sprinkles) ready for each owl. 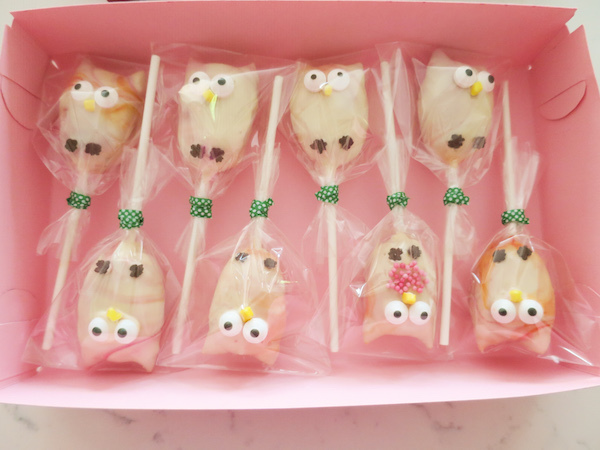 You'll also need a cake pop stick for each cake pop. 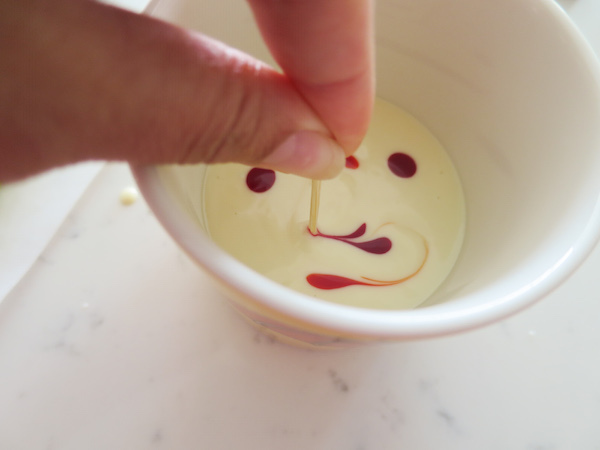 Melt the white chocolate in double boiler or microwave in short intervals until smooth and runny. 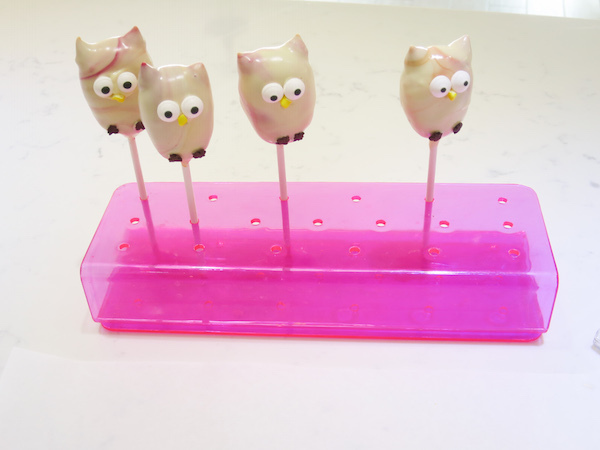 For marbling, add drops of chocolate colouring and swirl around using a toothpick. Remove chilled cake cones from the refrigerator. 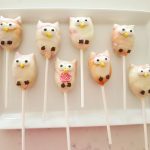 Dip a cake pop stick in melted white chocolate and insert in the cake cones from the narrow end gently pushing up to about middle so that you can feel it sits firmly on the stick. Dip bottoms of butterscotch chips in chocolate and attach as ears on the sides on the top. Carefully dip the cake into melted white chocolate tap off the excess chocolate and quickly apply candy eyeballs, yellow beak and sprinkle feet. 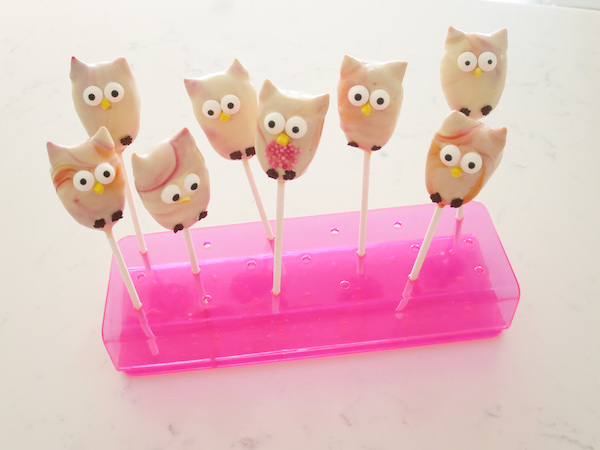 Place in a cake pop holder and leave to dry. Repeat for remaining cake pops adding some colour drops in the chocolate for stronger marbled effect. You can use additional sprinkles for giving them unique features - such as bows or coloured tummy. 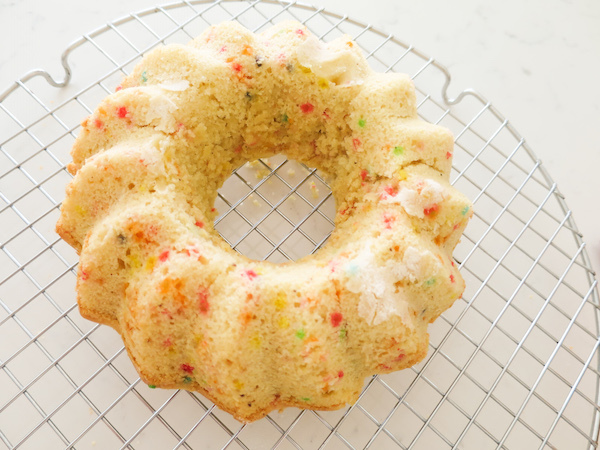 Crumbly sweet vanilla confetti bundt cake. Preheat oven to 160°C (320°F) and lightly grease and flour a bundt cake tin. In a mixing bowl beat sugar and butter until smooth, then add eggs one at time and continue to beat on medium speed. Mix vanilla extract and seeds with milk. Add the flour mixture and vanilla flavoured milk into the mixer and continue to beat until incorporated and smooth. Remove from mixer and add the sugar sprinkles gently folding them in. 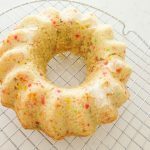 Pour into prepared bundt cake pan and bake in preheated oven for 30-35 minutes, until a toothpick inserted in middle comes out clean. Lift onto a wire rack and allow to cool. When ready to remove from the pan if it sticks just run a knife around the inner edge and it should come off easily.